For quite some time now, you’ve been wanting to improve your smile and increase your confidence, and you’ve decided that this is the year to do it. You’ve heard a lot of positive things about the effectiveness and comfort of the Invisalign method and have decided to go that route. But there are some things that you need to be aware of so that your experience will be the best that it can be. For starters, you need to know how to care for your aligners. That’s why your dentist in San Antonio has decided to weigh in with some tips. Find out what they are as you continue reading. 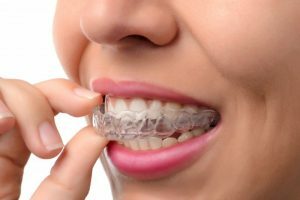 Before we get into how to care for your Invisalign aligners, let’s take a moment to discuss what they are and how they work. They are clear, BPA-free plastic trays that are custom designed to comfortably adjust gapped, misaligned or crooked teeth until they are fully corrected. After your trays are fabricated, your dentist will give you all of them at once, so that you don’t have to go back to the office for adjustments. You will simply put in the next set of trays in the sequence every two weeks and discard the previously worn pair. Removal – One of the advantages of your Invisalign trays is also a requirement – that you remove them before you eat. It’s because it’s impossible to eat with them in your mouth, but it’s also a big perk for you because you can eat and drink the foods that you prefer. Cleaning – Another way that an advantage correlates with a necessity is in the cleaning process, meaning that since you can remove your aligners, you are required to clean them before re-inserting them into your mouth. This washes away the harmful bacteria that grow on your trays. Oral Hygiene – Believe it or not, practicing excellent oral hygiene is an indirect way of caring for your Invisalign aligners because, as stated above, it removes harmful bacteria. The difference is, though, that you’re addressing the ones that live in your mouth. And these dastardly fiends would then be transferred to your aligners. Leaving Your Trays Out Too Long – In order for the process to be effective, you must keep your Invisalign trays in your mouth for at least 22 hours a day. So if you decide not to follow that rule, you will be working against your own progress. Eating Junk Food – Bacteria love tight, warm places, so the area between Invisalign aligners and your teeth is perfect for them. You don’t want to encourage their growth by consuming an abundance of junk food, because bacteria feed on the sugars. Drinking Liquids with Color – As mentioned earlier, the only liquid you should consume while wearing your aligners, is water. Other than that, sodas, coffee, tea and other drinks with a hue, can cause staining of your teeth and Invisalign aligners, which defeats the purpose of wearing clear trays. So now that you’ve learned more facts about Invisalign aligners and how the process should flow, you’re ready to start a new chapter in your life. Contact your local expert on Invisalign in San Antonio to learn how you can take advantage of this offer. Dr. Troy Jones received his undergraduate degree from the University of Texas and then went on to earn his dental degree from the University of Texas Health Science Center at San Antonio. A member of the American Dental Association, Dr. Jones has over 29 years of experience in dentistry. He practices at Jones and Knight DDS and can be reached for more information through his website.